The DURABLE Name Badge Sets contain everything needed for the creation of professionally printed name badges. 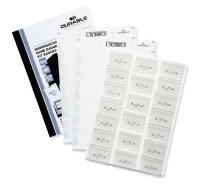 This set contains 20 combi clip name badges and printable inserts. Use DURAPRINT® Online to produce professional name badge inserts. The complete solution for creating professional name badges quickly and simply: Name badge set with combi clip badges and 3 A4 insert sheets. The DURABLE Name Badge Sets contain everything needed for the creation of professionally printed name badges. 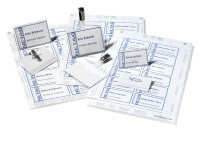 This set contains 20 pin name badges and printable inserts. 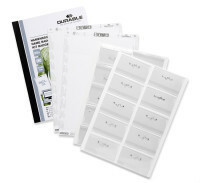 Use DURAPRINT® Online labelling software to create professional inserts.